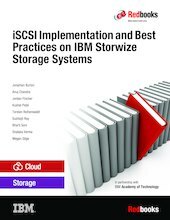 This IBM® Redbooks® publication helps administrators and technical professionals understand Internet Small Computer System Interface (iSCSI) and how to implement it for use with IBM Storwize® storage systems. iSCSI can be used alone or with other technologies. This publication provides an overview of the iSCSI protocol and helps you understand how it is similar to and different from Fibre Channel (FC) technology. It helps you plan and design your network topology. It explains how to configure your IBM Storwize storage systems and hosts (including IBM AIX®, Linux, VMware, and Microsoft Windows hosts) to interact with it. It also provides an overview of using IBM Storwize storage systems with OpenStack. This book describes configuring iSCSI for IBM Storwize and SAN Volume Controller storage systems at Version 7.6 or later. In addition to configuration, this publication provides information about performance and troubleshooting.